The Cornwall Collection includes 2 sets of Bride & Groom (one light skinned and one dark skinned) The set on the right is in the Museum on the west coast. The light skinned set is on the East Coast - where it has been since last fall when it was presented to MB for her accomplishment of getting the PEZ collector Robbie to be a REAL groom. As you can see. PEZ can be quite valuable. The above are "original" Bride & Groom" PEZ Pals. And as in real life a good bride is far more valuable than a groom. PEZ started out in 1927 Austria as a brick shaped peppermint (PfeffErminZ) adult candy marketed as an alternative for smoking. It was carried about in pocket tins (similar to present day Altoids). An “easy, hygenic dispenser” was created in 1948 which are referred to by collectors today as “Regulars”. A few years later character heads were placed on the dispenser to make the product appeal to Americans and to market to children. Santa Claus, Mickey Mouse and Spacetrooper were among the first characters. Four fruit flavored Pez were also introduced. The flavor list has grown to more than 18, plus 3 sugar-free and 4 kosher. 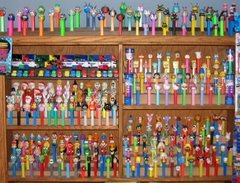 Today PEZ are made Austria, Czeck Republic, China, Hungry, Hong Kong, and Yugoslavia including a plant in Orange Ct. which alone produces over 3 billion candies a year. THIS IS THE DOCUMENTARY TO PRESENT THE BEGINNINGS OF THE CORNWALL PEZ MUSEUM.